The new 2018 Hyundai Verna is the latest firecracker from the Korean carmaker. The 5th generation of the compact sedan arrives well in time to catch the festive season across India, and in typical Hyundai fashion its looks to be another blockbuster. But I have good news for you – that is not simply because the new 2018 Hyundai Verna is priced super aggressively – its more so because it is, in fact, a great little package of excellent features and good overall performance. Read on to know more! The all-new 2017 Hyundai Verna is available in diesel and petrol – and both engines types have the choice of a 6-speed manual or 6-speed automatic variant. Hyundai has ditched the 1.4-litre engines this time around and has opted for the 1.6-litre on both engines. Yes these are the engines from the last car, however they have been redone almost completely, and are now both more refined, more efficient, and for the most part, more fun too! View offers on Hyundai Cars from Hyundai dealers in Hyderabad at Autozhop. The outgoing Verna was a tad too long in the tooth, but the fluidic design language did make an impact and even the competition was forced to respond with radical designs. I personally believe that the design didn’t age too well, and perhaps the designers at Hyundai resonate with my thoughts. The new Verna incorporates cleaner lines, has less creases and uses more angular cuts for a chiselled look. The face looks handsome and sharp. I prefer the older design of Hyundai’s hexagonal grille, and the new one draws attention away from the good-looking features like the sleek headlamps or the detailed fog lamp housings. There is no denying that the cascading grille with its chrome treatment looks more premium though. The headlamps have LED DRLs shaped similar to those on the Elantra. Ditto for the detailing of the tail lights and the rear bumper. 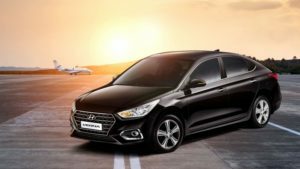 Look at the side profile though and you will notice that the Verna has a tallboy stance compared to the sporty low-slung poise of the Elantra. The sharp shoulder line and detailing of the doors looks classy, while the headlights and tail lights extending sharply into the bodywork add a sense of motion to the design. The outgoing Verna started the buzz about the diamond-cut finish for the alloy wheels and the new ones get it too, albeit with a new design. The interiors of the Verna were always one of its strong points and the new car carries on the same levels of quality in materials and plastics. The design though is very similar to what we have seen on other newer Hyundais, so it lacks any novelty and this is a little let down for an all new car. Compare it to the older Verna, and this design makes it seem a bit tacky and garish. Also, the switches both on the dash and the steering wheels all have very positive actions and feel solid and well built. The central console features a large 7-inch touchscreen display that is thankfully paired with buttons for the separate functions. And this makes the experience more fluid and less distracting than an all-touch-based system like in the Maruti Ciaz for example. The front seats feature a nice soft cushioning with good lumbar and lateral support. The seats could have been a little longer to offer just a tad better underthigh support. As it stands they are not unsupportive but we would have like just a little more support. The front seats also adjust for a really generous amount of legroom at the front. In fact this car could make even a 6’5” auto journo like my colleague, Tushar, comfortably. Unfortunately, he wasn’t with us on the drive but trust that we will put this to the test when we road test the car shortly. It’s also the first car to feature air-cooled seats in the segment, and in the hot and humid weather in Kochi they were a god-sent. Surprisingly, with the increase in dimensions the room in the rear seat doesn’t seem to have grown by much. There is sufficient legroom for full sized adults and sitting three abreast will also be a bit of a squeeze. It’s nowhere near as generous as the Ciaz or the City. Pampering here is by way of rear AC vents and a USB charger in all but the lowest E variant and that at least is a step in the right direction. The Verna now come with just two engine options, petrol and diesel, and both are the more powerful 1.6-litre engines. The VTVT petrol makes 123PS of power and 151Nm of torque while the CRDi diesel makes 128PS and 260NM of torque. Manual and automatic transmissions are available with both engines and in the interest of better driveability and efficiency they are both 6-speed units. It is a little clattery though and at just above idle and between 1100-1800 rpm at medium throttle inputs, it’s quite audible inside the cabin. In all other rev ranges the engine does quieten down to a much more bearable note. Hyundai is claiming that the diesel should return 24.75kmpl for the manual transmission and 21.02kmpl from the auto box. The previous generation Verna was rated at 23.9 kmpl for the manual, and 19.08 kmpl for the auto. The 123PS petrol is undoubtedly the quieter of the two and considering that it has been tuned for better driveability in town it doesn’t like being rushed either. If calm and collected is your mood then it will reward you with smooth progress with as much as 130.5Nm of its 151Nm total available from as low as 1500rpm. In fact, with the 6-speed manual transmission we were even able to pull away (very slowly) from as low as 25kmph in sixth gear without so much as a complaint from either the engine or the transmission. If you need to make rapid progress, for example when we had to make it back to the hotel before they shut the buffet, then you need to keep the petrol spinning over 3500-5000rpm which is this engine’s sweet spot. Hyundai is claiming 17.7kmpl for the manual and 15.92 kmpl for the automatic petrol. This is marginally higher than the Verna 4S’s 17.01 kmpl for the manual and 15.74 kmpl for the previous 4-speed auto. We didn’t get a chance to drive the diesel manual but the 6-speed conventional torque converter automatic transmission was a pleasant surprise. Torque converter transmissions were called ‘slush boxes’ on account of their slow responsiveness and disconnected feeling at the throttle pedal. But I really liked this Hyundai iteration. It’s responsive and quick and when driving around town and light or medium throttle inputs feel very direct and connected. Only when you floor the pedal do you start to feel some slip and you can hear the transmission struggling to keep up with the engine revs. You can also switch the transmission into manual mode if you are in the mood for some spirited driving, where it will hold a selected gear, but we preferred to leave it in auto mode, which seems to make the most of the torque from the diesel engine and still gives you the buttery smooth gear changes that torque converter gear boxes are known for. A claimed mileage of over 21kmpl (diesel) makes it sound almost too good to be true. Hyundai has been improving their driving dynamics lately and the Verna is testimony to the fact. Unlike the outgoing model, which had a floaty feel at highway speeds, the new one feels significantly more sure-footed on the highway as well as around the twisties. There is a some vertical movement around switchbacks, but it reduces by a fair bit with a full house. The ride quality is excellent and it again reminds me of the Elantra with how silent the suspension is over potholes, ruts and joints. Tyre noise creeps into the cabin at about 90kmph on tarmac and 70kmph on concrete, while wind noise is audible past 120kmph. The tyres have a decent grip for regular use and complement the progressive braking of the Verna quite well. The steering feel and feedback has been improved too, but the movement has an elastic feel to it at slower speeds as the wheel seems eager to return to its centre position. Overall, the Verna is easy to drive and feels convenient in the city and on the highway. It isn’t an enthusiast’s driver, but I personally wouldn’t mind living with a Verna anymore. The top end versions we drove featured everything from navigation to smartphone connectivity functions like Android Auto, Apple CarPlay and MirrorLink. It also now gets an electric sunroof in keeping up with the trends in the segment and adds another first with the hands-free boot lid that opens if you stand within three feet from it for over three seconds with the key in your pocket. This convenience feature is to help single shoppers whose hands are occupied with shopping bags. It also features a reverse parking camera and parking sensors but misses out on all-LED headlamps and rain-sensing wipers that are available in the Honda City as well. The top end variants also continue to get 6 airbags while dual airbags and ABS is standard across the range. Another thoughtful feature is an app called Hyundai Auto Link that is standard in the top end SX(O) variants. This app was developed at Hyundai’s R&D centre in Hyderabad. The app pairs the car to your smart phone and gives you complete vehicular information from real time data like engine speed, engine load and braking habits, to other information that can be accessed from the comfort of your home as well like booking a service or checking up on your driving history or even storing your last parking location. Hyundai Verna On-Road Price in Hyderabad ranges from 9,25,350 to 15,25,893 for variants Verna 1.6 VTVT E and Verna 1.6 CRDI SX Plus AT respectively. Hyundai Verna is available in 12 variants and 7 colours. Below are details of Hyundai Verna variants price in Hyderabad. Check for Verna price in Hyderabad at Carzprice. The Verna reminds me of the new Elantra in more ways than one and that isn’t a bad thing. The elder sibling has won all the comparisons we put her through, and the Verna replicates almost all of the virtues that helped the Elantra win. Furthermore, Hyundai has managed to price and package the Verna rather well despite the absence of the entry-level 1.4l engines and the inclusion of new-generation safety features and creature comforts. As a package then, the Verna should be able to breathe fresh air into a segment that is fighting for existence in the wake of the compact crossovers and SUVs.